5D Solutions provides one of the most thorough car grooming services in Singapore and we are confident that we can get your car cleaned and looking like brand new again. No need to break a sweat to get your call all polished and shiny, our experience crew can easily get in done in a jiffy while you can spend quality time with your family either at the nearby mall shopping or just chilling at the cafe. Drop by our office and we would be glad to show you what sort of car grooming services we can provide. Sent my car in today and was served by boss Stanley. Stanley is a knowledge and patient guy who will explain his products to you in detail. In the end , I opted for the extreme package and the guys really did a good job. Thank you Stanley and team for a job well done. Stanley and his team, I only have good words for them! I have coated my car since Jan 2016 and I saw what benefits it brought. A driver opened his car door so wide that it hit my coated door..I went to check! No damage! The team are professional and hardworking, even with the washing of my car on a weekly basis! Thumbs up for 5D Solutions! Ready to get back the original shine that your car once had? Then the external car grooming services would surely impress you. Using snow wash and clay bars, we will decontaminate the surface of your car to ensure that your car surface is free from any dirt and impurities that may be on the surface. We will then polish the car to prepare the car surface for the application KubeBond Diamond 9H. These coatings help to protect your car paint surface, reduce stains from watermarks and at the same time give it a nice gloss and shine. 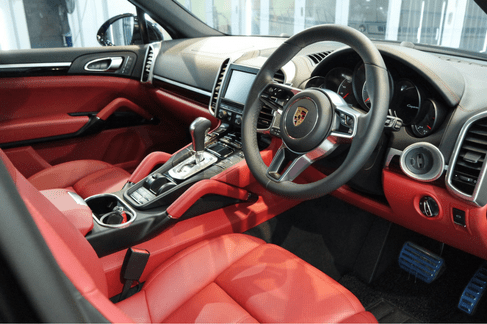 With this interior car grooming services, we have a range of packages to suit your budget. From the basic interior cleaning and restoration to more thorough interior grooming services such as anti-bacterial cleaning with interior sanitization, we will help to remove those stubborn stains and scratches from the interior of your car. In addition, we can also use the KubeBond LeatherShield to help protect the leather and keep it clean for a longer period of time. We plastic areas, we will also apply the KubeBond Nu Interior. 5D Solutions provide car paint protection, car polishing and car grooming services. Drop by our office today or book an appointment with us to find out more about what we can do for you and your car. The car can be a hotbed be dirt and bacteria is you do not clean it properly. Just think about it, people come in and out of the car, they may have been sitting in the office, or may have visited a hawker center. All the dirt and oil from your clothes will definitely come into contact with your car seats. After a few months going through these routine, dirt and bacteria will definitely build up in the car and also cause the leather to turn a little black. With proper car grooming services, you will definitely be able to prevent this from happening. By taking proper car of your car, you can ensure that the resale value will be maintained when you eventually need to sell-off the car. Factors like mileage are important in determining the value of the car, but other important factors such as the condition of the car both externally and internally can lower the value of the car. Thus it is important to take good car of your car using proper car grooming services and the right car paint protection system if you want to maintain the resale value and get a good deal when selling your car. Keen to start getting your car groomed and protected? Drop us an email to find out what is the cost to get your car groomed or visit our showroom today to speak to our friendly consultants!